Here Paul reflects on his previous statement of the one way of salvation from sin by the propitiatory death of Christ, which avails for all who believe (Rom. 3:21ff). Justification is received only by faith and is grounded in what Christ did once for all in his death and resurrection (4:25). Paul’s point is that we are not addressed merely as discrete individuals; instead, we are a team of which we all were members. His sin plunged the whole team into sin, ruin, death, and condemnation. What Christ did for us was also done as the head of a team of which we are a part. He did it on our behalf, for us–and God reckons it to our account as a result of our being united, through faith, with him as the head of the team. Our justification is therefore grounded on union with Christ. In Romans 6:1ff, in answer to charges that his gospel encourages moral indifference, Paul insists that believers, the justified, live to Christ and do not give themselves over to sin. This is because they died with Christ to sin and rose again to new life in his resurrection. Not only did Christ die and rise again for them, but they died and rose with him. 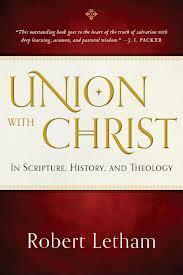 Union with Christ is the foundational basis for sanctification and the dynamic force that empowers it. As Paul says, “Do you not know that as many were baptized into Christ Jesus were baptized into his death; we were buried with him through baptism into death, so that as Christ was raised from the dead through the glory of the Father so we too should live in newness of life” (6:3-4). Paul argues in 1 Corinthians 15 that the resurrection of Christ and the future resurrection of his church is one reality (vv. 12-19). Paul argues back and forth from one to the other. If Christ is not raised, there can be no resurrection of believers. If there is no general resurrection, Christ cannot have been raised himself. The two stand together. In fact, Christ has been raised–and so, therefore, will we be. Christ is the firstfruits of the resurrection of believers at his return (vv. 19-23). Not only is his resurrection first in time, but as firstfruits, it is of the same kind as the full harvest. Hence, it is the guarantee not only that the full harvest will be gathered but that both his resurrection and ours are identical. From this it is clear that the resurrection of believers at the parousia is a resurrection in Christ. The resurrections are effectively the same…Christ resurrection and the resurrection of the righteous, separated by indefinite time, are identical because the later occurs in union with the former. Each of those points could be expanded upon at length, but this brief summary gives us a glimpse into the way the biblical record places our union with Christ at the blazing center of our salvation through Christ. There is no Gospel without union. Great stuff bro. Read a fascinating article in Westminster Theological Journal about John Flavel and how he too saw union with Christ in salvation. Apparently, some view Justification, rather than “unio Christi” as central, but i am of the mind that these guys are correct and union with Christ is the central aspect of salvation. Sorry, should say John Flavel saw union with Christ as the priority in salvation as opposed to justification. See it now. Yes, I’ve been wrestling with the logical priority of justification and union. More and more I’ve been seeing union as the key, especially in the justification/imputation issue. Imputation only makes sense to me as incorporation/inclusion in Christ’s achieved righteousness by way of union. Otherwise it is a legal fiction of the sort it is often charged with. One cool point this article brought up was Calvin’s treatment of 1 Cor. 1:30 and how he saw this as describing how union with Christ is the pre-eminent thing which then brings all the following benefits Paul lists in that verse. Makes sense to me. Yeah, that’s one of the biggie verses for union. I can’t stress this truth enough! As a friend of mine put it: all benefits are sides of the same gem that is Union. Great 2 cents. I think you’d love this book, then. He has a significant section on election and union with Christ that articulates a similar view. Blessings!! *sigh* Derek, feels like since i commented on your post about the burning of heretics you don’t respond to my comments anymore. did i step over some hidden line? Did I miss your comments somewhere? commented on a few posts over the past while and it seems like you reply on every other comment but mine. Not the end of my life, just wanting to be sure i haven’t caused offence is all. appreciate your blog very much. actually … maybe you are missing my comments. I have commented above on this very post. Are my comments not coming through perhaps? is actually pleasant and the visitors are in fact sharing pleasant thoughts.